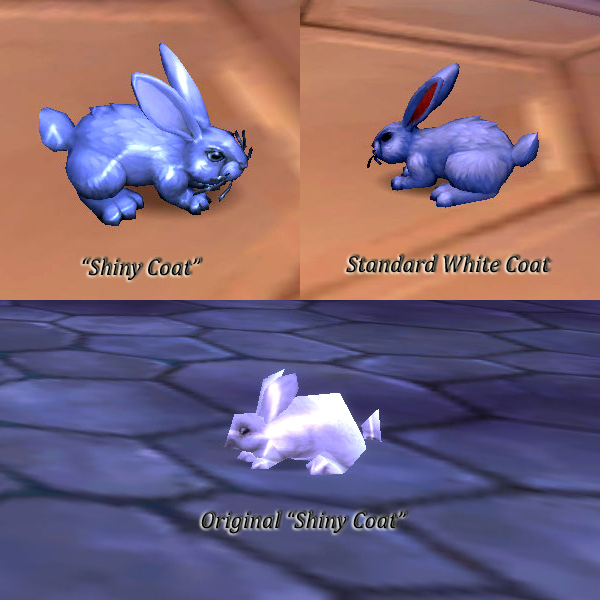 I had a [pet]mountain cottontail[/pet] before the patch that changed this coat color into a color changer. After reading the news that they have given us back the shiny coat, I pulled the one I had out. To my surprise, it had the new shiny coat. I dismissed it and re-summoned it, and it was a different color. Apparently, the color changer now randomly changes color among the various colors that this pet is able to come in. For comparison, here is a composite picture showing my shiny mountain cottontail in the "new" shiny coat, ordinary white, and an older shot from before Patch 7.0. So, it appears that even if you have not caught a replacement yet, you can still show off your shiny pet (you just need to be willing to summon/dismiss it until it is the color you want it to be). I decided to keep my original "shiny" cottontail and get a second, new shiny version. The original's got a special spot in my collection - more-so now that it's a color-changer! Not necessarily relevant to the OP but it is relevant to the thread title. I've noticed that wild mountain cottontails in Highmountain can spawn with a shiny texture, so you can just look at one in the wild and see if it's shiny or not. Of course,it's worth battling a normal one to see if there's a shiny one as a secondary pet, but you could also just kill them until you get a shiny one to spawn. Quintessence wrote: I decided to keep my original "shiny" cottontail and get a second, new shiny version. The original's got a special spot in my collection - more-so now that it's a color-changer! I have to agree. I would love that golden version of the "shiny" mountain cottontail as an actual color.